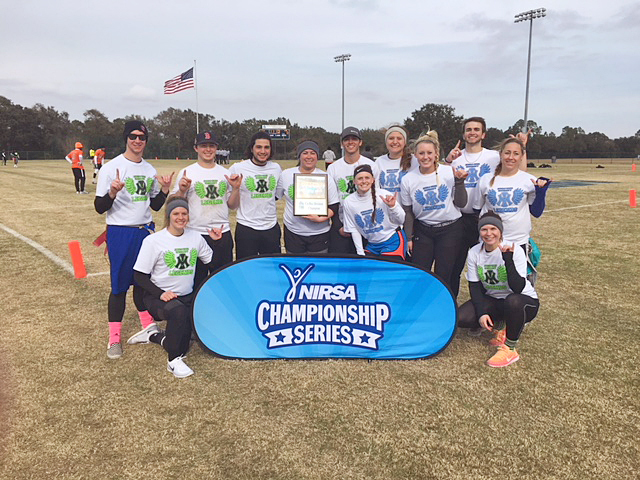 Intramural flag football team the IM Legends emerged victorious at the National Flag Football Championships during the NIRSA National Campus Championship Series held at the University of West Florida in Pensacola Jan. 5-7. "Winning the tournament was very exciting and surprising all at the same time," junior Izzabella Bluso said. "Going into the tournament, we knew we needed to play our very best because we did not have our winning team." In order to bring home the victory, the team came up with a strategy using defense and the scoring system to their advantage. "In Co-Rec, if a woman scores, you get 9 points instead of the usual 6," team captain Jacie Klose, senior, said. "So our strategy is to get as many girl touchdowns as we can in order to score more points." Co-Rec teams require a specific number of male and female players per team. "Defense played lights-out all game from start to finish," added Chuck Tapia. "I wish we would’ve been able to score more when we had the ball, but we got out of there with the win." Before claiming the title, however, the team was faced with challenges like travel, hotel and eligibility forms and waivers. "It was chaos before the tournament began, but I knew that once we finally hit the road that everything would be okay," said Klose. Bluso also shared how they lost in the quarterfinals of the women’s competition. "We brought a women’s team to this tournament also, and once we lost in the quarterfinals we knew we didn’t want to walk about from this trip empty-handed," she said. "After our two pool play games, we knew that we were very lucky to walk away on top because we did not play very well." Nevertheless, things worked out for the team in the end, according to Klose. "Overall, I am very pleased with how we performed at the national tournament," she added. In addition to the national title, two members of the team received individual awards. Klose received an award for Female MVP, while Miguel Castillo got Male MVP in the Co-Rec division. Members of IM Legends include Klose, Bluso, Tapia, Chase Churchwell, Valerie Villalva, Lindsey Englehart, Shannon Thompson, Stefani Richardson, Amanda Saenz, Taylor Hoelscher, Jonathan Arthur and Julian Helms.